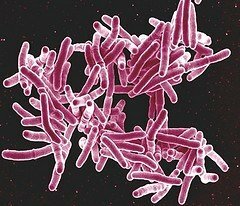 Tuberculosis is an infectious airborne disease caused by a rod shaped bacterium known as Mycobacterium tuberculosis (MTB) (Figure 1). This isan aerobic bacterium which usually infects humans. They are non-mortile, acid-fast positive, non-spore forming, catalase positive, oxidase negative and have an extremely slow generation time. Mtb is mainly transmitted by aerosolization and initiated by the deposition of Mtb containing aerosols on the lung alveoli. There are two types of Mtb as pulmonary and extra-pulmonary (Smith, 2003). Extra pulmonary Mtb is the TB type that occurs in the organs other than lungs such as lymph nodes, abdomen, genitourinary tract, joints and bones etc (Lee, 2015). Innate immunity and adaptive immunity plays a critical role in TB. The principal mechanisms of the innate immunity are macrophages, neutrophils, natural killer cells and complement system. After the inhalation cilia sweep away the microbes that enter the respiratory tract. Ultimately, MTB reaches alveoli and enters through M cells of bronchiolar associated lymphoid tissue and it meets macrophages (Figure 2), dendritic cells (Figure 3) multinucleated giant cells and pulmonary epithelial cells. 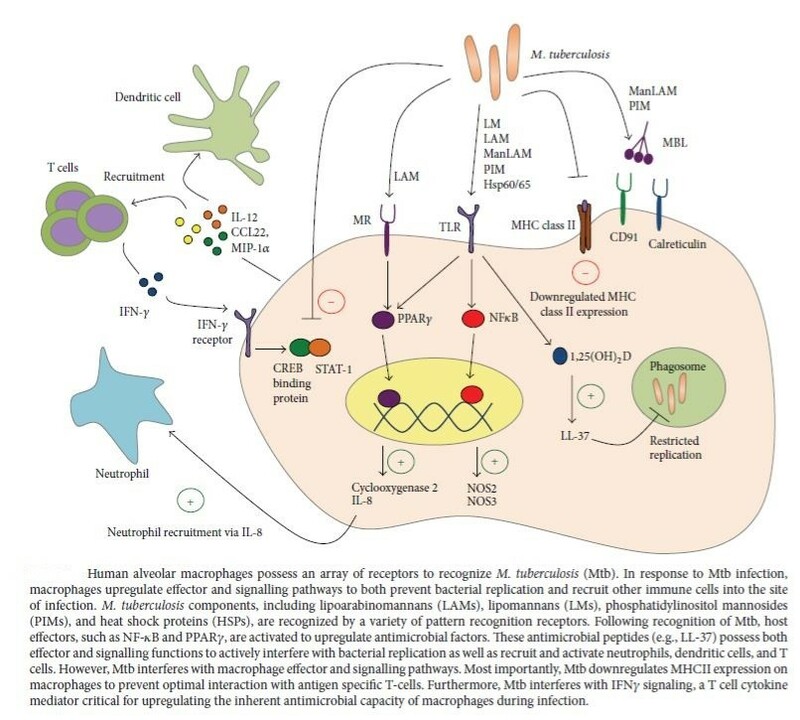 Macrophage has numerous specific receptors to identify MTB. Macrophages carry out phagocytosis as it recognizes MTB as a foreign body. Bacterium is then taken in to the macrophage and forms a phagosome and activates the reactive oxygen species. It combines with a lysosome forming phagolysosome. Since the cell wall of MTB is thick and it consists of toxic mycolic acid it is taken in to another vesicle called endosome and ultimately the processed peptides are presented with MHC II. MTB replicate inside the macrophage and ultimately it kills the macrophage. This causes inflammation. So that T-cells, B-cells, fibroblasts, foam cells, multinucleated giant cells of langhans type, peripheral recruited lymphocytes and other macrophages contribute to form granulomas surrounding the infected macrophages. Center of granuloma undergoes necrosis. Neutrophils are recruited with the secretion of IL-8 by infected macrophages. They act in non-phagocytic way and promote cytokine signaling (Figure 4). Other monocytes also extravasate to the infected site due to the chemokine signals and they differentiate into macrophages thereby they ingest and kill MTB. Interaction of T-cells and macrophages is the central elimination mechanism of MTB. 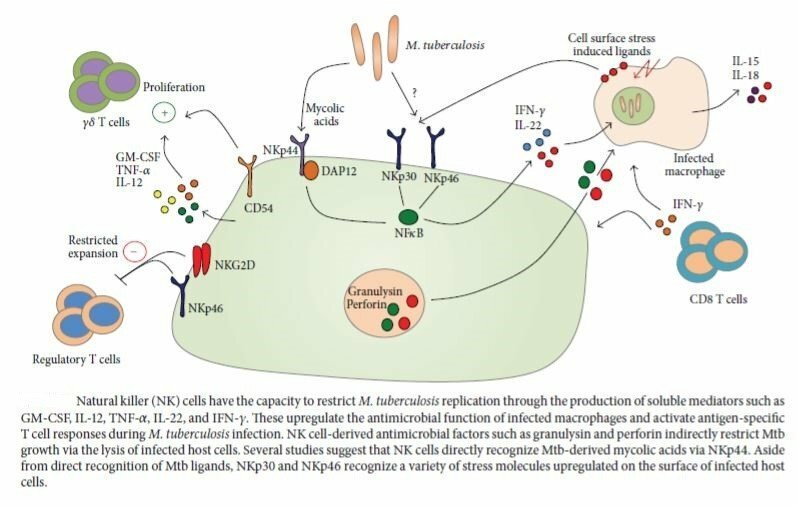 NK cells also take part in destroying infected cells by cell lysis and they produce IFN-γ (Figure 5). This enhances the phagocytic activity of macrophages and macrophages produce IL-12, IL-15, IL-18 and TNF-α. Complement activation causes lysis of MTB by formation of membrane attack complex and it enhances phagocytosis by opsonisation (C3b) (Todar, 2012; Gupta et al, 2011; Vankayalapati and Barnes, 2009). 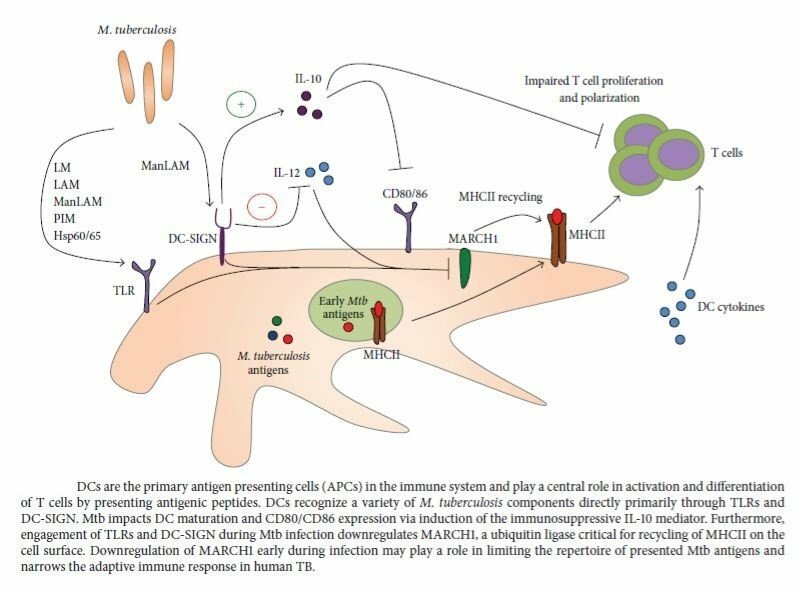 When the MTB concentration increases acquired immunity provide defense against MTB. 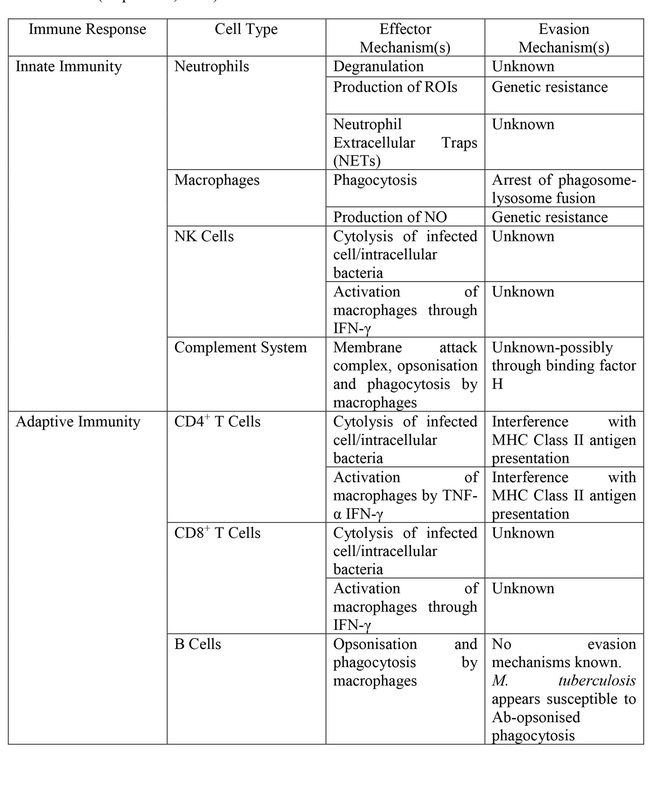 This provides defense by means of humoral (B-cell mediated) and mainly by cell-mediated (T-cell mediated) immunity (Table 1). They recognize the antigens presented by antigen presenting cells (DC’s) with MHC presentation. CD4+ cells recognize processed antigens with MHC II presentation only. CD4+ cells get activated and they induce the secretion of cytokines. These cytokines activate CD8+ cells, B cells and macrophages. CD8+ cells it induces lysis of infected cells by secretion of perforin and granulysin. 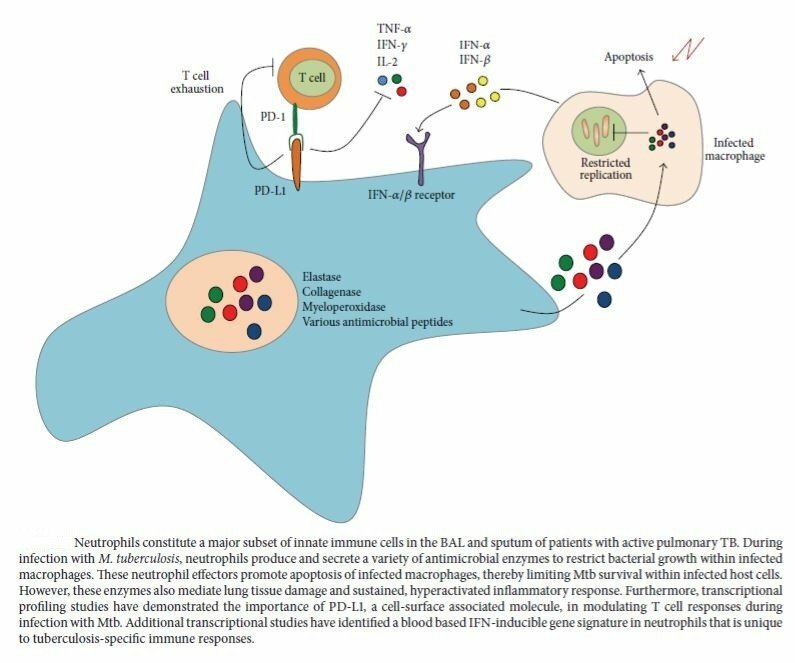 Pro-inflammatory cytokines such as IL-1, IL-6, IL- 21 and anti-inflammatory TGF acts on MTB. IL-17 plays an important role in granuloma formation. IL-4, IL-10 and IL-13 reduce the damage caused by restricting the activation of macrophages. B cells differentiate in to plasma cells and they produce antibodies against MTB and they attack by means of lysis, opsonisation and tissue fixation (Sakamoto, 2012; Gupta et al, 2011).